Cork comedian Chris Kent returns with his 6thsolo show Looking Up. Chris has spent the past year balancing comedy with being a stay at home dad and trying to grow a beard. He has also removed the word “mate” from his vocabulary as it takes too much effort to say in an Irish accent. T.V. appearances include the RTÉ 2 panel show Next Year’s News, The Craig Doyle Show and Conor’s Dad in the hit series The Young Offenders. In the UK, he has appeared on Russell Howard’s Stand Up Central for Comedy Central. On radio he has been a regular panelist for the RTE Radio 1 show The Second Republic and a guest panelist on BBC’s The Blame Game. In 2010 he was the recipient of the Comedy Smack Down Award at the Galway Comedy festival, and Winner of the Bulmer’s Nuttin’ But Funny Comedy Award 2009. 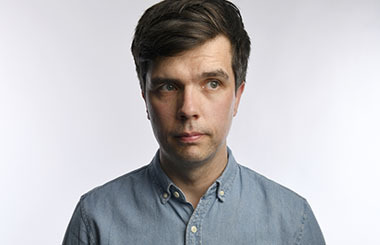 Following on from being listed as “One to Watch” in The Dublin magazine’s “Red Hot and Rising” for 2012, Chris Kent was voted as one of the Top Five Irish Comedians by Hot Press Magazine in 2013.